A special treat just before Christmas in our home was when my dad would bring home a special Christmas sweet bread. It was a very rich dessert bread full of fruit and almonds. Christmas Stollen (we pronounced it Shh tollen) was different from the Fruit Cake we see all the time nowadays. 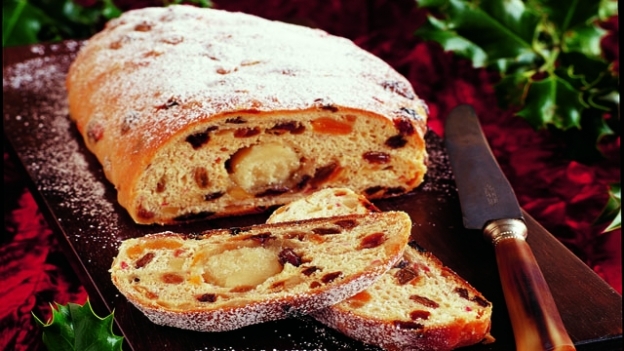 Long before Columbus discovered America, stollen was baked at Christmastime in Dresden Germany. The dried fruits are macerated in liquor and when the bread comes out of the oven it is then slathered with melted butter and rolled in sugar. It thus represents the infant Jesus wrapped in swaddling clothes. Since the 15th century, there was a Stollenfest in Dresden every year, right up to the fall of the monarchy in 1918. If you have never eaten stollen, you are in for a gustatory delight. This moist specialty bread is a little like the Italian Pannettone or the Danish Julekage, but its special shape is very appealing to Christians in particular and its flavour to everyone. If you are a baking enthusiast, bite into some serious history here; make yourself a Christmas Stollen. Put the raisins and currants in a heatproof bowl and put in the oven just to warm, 3-4 minutes. Pour on the liquor and set aside. Shut off the oven. Stir the fruit to immerse fully in the liquor. Sift the flour and salt into a large bowl and stir in the sugar, spices and zest. In a small bowl, mix the yeast with the slightly warm milk. Pour this into the flour and stir a little of the flour from around the edge into the milk mixture to make a thick batter. Sprinkle some flour on top of batter, then cover with plastic wrap and leave in a warm place for 30 minutes. Add the melted butter and egg and mix into a soft dough. Turn out the dough onto a lightly floured surface and knead for 8-10 minutes, until smooth and elastic. Place in an greased bowl, cover with greased plastic wrap and let rise in a warm place for 2-3 hours or until doubled in bulk. Working on the almond filling: combine the ground almonds and sugars. Add the lemon juice and enough egg to knead into a smooth paste. Shape into an 8 inch (20cm) long sausage, cover and set aside. Turn out the dough onto a lightly floured surface and punch down. Pat out the dough into a rectangle about 1 inch thick and sprinkle on the golden raisins, currants, candied fruit and almonds. Fold and knead the dough to incorporate the fruit and nuts. Roll the center slightly thinner than the edges. Place the almond paste filling along the center and fold over the dough to enclose it, making sure that the top of the dough doesn’t completely cover the base. The top edge should be slightly inward from the bottom edge. Place the loaf on the prepared baking sheet, cover with a lightly oiled or greased plastic wrap and let rise in a warm place, for 60 minutes or until doubled in size. Meanwhile, preheat the oven to 400F (200C). Bake the loaf for 30 minutes or until it sounds hollow when tapped on its bottom. Brush the top liberally with melted butter and transfer to a wire rack to cool. Dust heavily with confectioners’ sugar just prior to serving. So that’s how to bake a Christmas Stollen. A little detailed, but these step by step instructions make the method easy to follow. Enjoy with coffee or black tea. KAVERI: It has a long history and a lovely rich taste. You and your family have a great big Happy Christmas. I would love to try this. Stollen is my hubs favorite...he has German roots and his Oma made one every Christmas. Thanks for sharing the recipe...have a Merry Christmas! Mmmmm.... just looking at this makes me miss my Mom! Merry Christmas and happy holidays to you and your family! The bread looks delicious! Stollen bread dessert that must be very rich but seems complicated preparation. Greetings. Stollen bread is so good. Haven't had it in awhile. Thank you for sharing the recipe. Maybe I can make it next year for Christmas? Stollen looks absolutely delicious. My mom use to make a pear bread when I was a kid that had dried pears and raisins in it that was very good too. Have a Merry Chistmas. Wow! I've made stollen before, but never with a filling...what a fantastic tradition. Merry Christmas! Sounds delicious!!! MERRY CHRISTMAS!!! http://chatonsworld.blogspot.com. So it's nothing like fruitcake? Because American fruitcake is awful. JOYCE; Please let me know what he thinks. Tell his Oma Ich wunsche deiner familie frohe weinachten. MY JOURNEY: I was touched by that beautiful sentiment. Have a blessed Christmas. STEPHEN TREMP: Thank You Stephen, back at ya'. LEOVI: A little complicated,definately for baking enthusiasts. Feliz Navidad Leovi. SUSANNE: A little detailed but worth it for once a year. Happy Christmas. The Golden Eagle: Thanks for calling. Happy Christmas. WORDS OF DELICIOUSNESS: Pear and raisin bread does sound good. I have 2 pear trees and made sweet and hot pear relish with it. We love pears, going to use in bread now. Thanks, have a happy Christmas. ELLEN: It is that. Happy Christmas to you and your family. CHATON: You and your family (including Cutie Pie)have a great big Happy Christmas. SONALI: Thank You and Happy Christmas greetings to you and family. PADHU: Thank You, it is. L.DIANE: My whole family agrees with you, except me. I actually love standard fruitcake, I guess it takes all kinds. Your kitty pictures are fantastic. Have a blessed Happy Christmas. I wouldn't have the patience to make it! Thanks for sharing! :- ) Something very special for this day!!! Wishing you and your family a Merry Christmas!!! UMA: Yes, is special. Thank You and Happy Christmas to you and your family. How fascinating. I just spent half of a phone conversation discussing stollen with my dear friend across the country, who makes it every year. I will send your version fo the recipe to her. She will love to see it! Thank you! Don't we all get nostalgic during the festival season. Lovely loaf, I'd love to have a slice with tea. Bellissima la tua versione natalizia dello stollen. Best part is that I even know what "gustatory" means. Looks fantastic, and I love the history behind it! thanks!! This looks great!! I loved the recipe!! Wish you a very happy year-end and a wonderful new year in advance! Slathered in butter and rolled in sugar--I'll take two. DAWN: Thank You Dawn, it is special. TORVIEWTORONTO: Thank You Akheela, best wishes to you and yours as well. MISHA: If you have never tasted Stollen you are in for a happy treat. PLATEFUL: Yes, we do get nostalgic. We had a lovely Christmas day. I hope you get to try Stollen. Happy New Year to you and your family. LAMUSICAZUCCA: Thank You for you lovely comment. Hope you have a happy New Year. MALLI: Glad to hear you love Stollen. Happy New Year to you and your family. INDIE TEA: Is delicious. We had a great time. Wish you and yours a Happy New Yewar. GENE POOL DIVA: Thank You, wishing you a Happy New Year. AL PENWASSER: Eat this sweet bread and you can taste "gustatory". Regardless, you and your family have a happy New Year. Dawn@LIGHTEN Up: Thank You Dawn, wish you a Happy New Year. PURABI NAHA: Thank You for your kind words. Wish You and your family a Happy New Year. MISSED PERIODS: Okay, two Stollen for you. MISHA G.: Thank You very much. 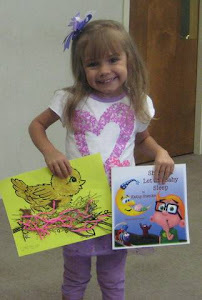 My BW (The Education Tipster) and I wish you every happiness and a less distressful 2012. Happy New Year to you and yours. Wishing u very Happy New Year. Dear Anthony, A very Happy New Year to you! PS: you brng what you write about to life. This is what makes it delicious to read your blog! Stopping over to wish you a Happy New Year!! Eating at home should be a delight. I wish you a happy 2012.
always wanted to try stollen. Wishing you a very Happy New Year, filled with loads of happiness, good health and wonderful blessings. May all your wishes come true. Sounds so delicious!!! Thanks for the recipe! NATURAL ONE: Yes,a delicious artisanal bread. Thank You. KITCHEN BELLEICIOUS: Thank You for your kind words, I wish I could send you some. Wish you a Happy New Year too. HEMALATA: Thank You, it is a festive bread indeed. Hope you have a great 2012. JEAN: Thank You so much for your compliments; we wish you and your family a very Happy New Year. MY JOURNEY WITH CANDIDA: Thank You very much, a Happy New Year wish to you. LEOVI: I agree with you, best wishes for 2012. ANZZ: Thank You so much for sentiments, I wish the same to you, have a great 2012. BRAGON DORN: It is all that, thank you for calling; best wishes for 2012. Ooh, not a chance I'd attempt to make this on my own, but I'm definitely going to check out the local bakeries for stollen. It sounds lovely all around. This looks superb. A Very Happy New Year to you. Dear Anthony--Happy New Year! My dinner awaits--you have inspired me to make something delicious tonight! I am so glad I have your blog to read. It is always delightful! HEY NICKI: If you live in a big city you can probably find Stollen. SENSIBLE VEGETARIAN: It is superb, Thank You and Happy New Year to you. JEAN: Thank You for those kind words, my best to you and your family. LOLY: Thank You, I enjoyed reading your posts. Looks an interesting dish...Just mouthwatering...looks so easy to prepare & delicious! KALYAN: It is all that for sure, Thank You for calling. NOW SERVING: Had a wonderful holiday season, hope you did too Priya.Cheers.